Becoming a digitally optimised business is not easy. And if you are a CIO or IT executive, there is even more pressure and imperative to ‘deliver’ when it comes to your digital transformation. With multiple issues to solve – from the inability to be agile and experiment quickly, legacy systems, data security and the challenges of working across silos – the IT department has its work cut out. In this interview our technology expert, Barry Sacks shares his thoughts on where IT fits into the ‘whole business’ challenge of digital optimisation and how a well thought out long-term technical and data architecture plan can bring your vision to life. Sophie: Barry can you introduce yourself and your role at DWG? I’m a partner within the Project & Technology team. What we effectively do is to enable businesses to technically deliver on their digital strategies and achieve their performance objectives. We align the organisations’ systems and data information needs with the broader aims of the business. I have over 25 years’ experience gained within start-ups, SMEs and blue chip businesses. I have also had the pleasure of being an entrepreneur myself. I bring that experience to help design, deliver and manage an organisations’ digital products and services, transforming them to a more digital way of working. For smaller organisations, I help them to think like a big organisation and what they need to consider for their next step of growth. For example organisational shape and design to enable them to deliver those systems and services effectively. In larger businesses frequently there is an impasse where they don’t know how to think with agility, like the start-ups who are often now threatening them. Sophie: Do businesses frequently believe digital transformation is driven by technology? Too many people think it’s IT-led. They may believe that they will just bring in a new marketing platform or content management platform, but the real challenge is about how you deliver the technology, process and people transformation. Technology is only one aspect. If you don’t balance and invest in all three, I don’t believe you will be successful. I’ve seen organisations that are too focused on ‘process’. If done wrongly process can paralyse a business. If you haven’t got the right people in place or the cultural attitude for digital transformation, you can have the best technology and the best processes, and you still won’t be successful. Change has to be sponsored and supported from the top down by the executive leadership. 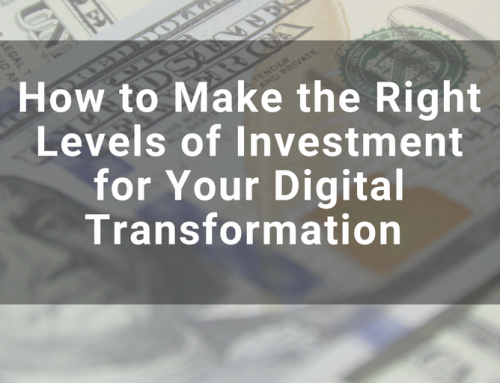 To help the organisation to buy into digital transformation and the benefits it will bring. If not the business will fail because it becomes merely a pet IT project. You need the appetite for change to enable a more capable, leaner organisation. Operating with greater agility, higher quality and at lower costs. The vision and strategy are critical for the business to move forward. Sophie: What should the role of ‘technology’ be within a business? If I contradict everything I’ve just said, I genuinely believe every business today is a technology business. It doesn’t matter what the origin of the business is – what you sell or offer – there will be no business tomorrow unless it’s technology-driven and considers itself a technology business. Technology is so essential to the success of how a business can engage and deliver to its customers, employees and supply chain. Without the right technology, it’s tough to compete successfully in a rapidly changing marketplace. Technology is the enabler for digital transformation. But you need to know your starting point and the direction you want to go. You must have an architecture in the broadest sense and understand how you’re going to digitise, as well as knowledge of the information you hold within the business. Sophie: How important is your data these days? The data and technical architecture are intrinsically linked. Businesses today need to be data-driven. You must look at what information you hold and what the gaps are. Ask yourself how you want to use, present and manipulate the data? Then you can work out technically how you do it. Historically businesses have used data as a retrospective on the performance. We’ve all been through the monthly reporting cycles where the report is already a month out date, and you use a prior year to set budgets for the current year. These historical ways of running a business are no longer fit for purpose. Businesses today need to be much more predictive. They need to use data and technology to predict what’s going to happen tomorrow, next week, next month and act accordingly. Fundamentally, digital transformation is about empowering a business to make those decisions almost in real time. Sophie: Have advancements in things like AI and SaaS have helped open up opportunities? Size is no longer a limiting factor. Everyone can benefit from the advancements in software as a service or SaaS platforms as an entry point. In terms of starting a business and having the right tools available, there has probably never been a better time to start on day one as a ‘digital’ business. Sophie: In your experience why do organisations struggle with IT change? I think the number one reason that organisations go wrong is culture. Often within larger businesses, it’s the internal politics that hampers the ability to change. To take an example, I worked for a large and extremely traditional company, with 200 years of history and some very entrenched views. It was a very siloed and functionally aligned. Some stakeholders had been there for a very long time, and these guys were being asked to come together as an agile team to implement new technologies. But they hadn’t been incentivised. They had already been through outsourcing journeys and offshoring of technology. So when presented with transformation or a request to collaborate it was challenging for them to do this without being incentivised by the leadership of the business. The second reason is capability. We’re (DWG) successful as a business because organisations recognise that digital transformation is hard, and it brings a capability requirement into an organisation that wouldn’t fundamentally exist. Sophie: What are the biggest challenges to fix? We’ve all been in businesses where you have a monthly cycle of setting a budget and strategy, and the job of the leadership team is to execute that plan or strategy for a 12 month period, review and then start the whole cycle again. The reality today is that life is day to day. While you need a strategy and vision for the business, you must have a higher degree of flexibility in how you’re going to get there and respond to market forces and growing competition. You need to be responsive and reactive to your user or client demands. You need a business model with agility built into it, to enable you to flex without going completely ‘off piste’, but recognising that there are many different ways to get there. You need to be innovative and creative in how the business arrives at the destination. A lot of the work I do in organisations is about transforming businesses from being task driven, top-down and fairly autocratic to being much more objective driven, and empowering leaders cascade down. Sophie: How important is it to be agile? Coming from a technical delivery development arena, I’m a big advocate of agile in the purest sense. There are some great tools on the market that enable individuals to break down their objectives into a series of tasks or stories and to deliver on those in rapid succession. You need to empower small teams to achieve their objectives and have team accountability to deliver. It’s quite tricky from a leadership point of view – to let go of the reins and to trust people. The role that we can play is to assess that capability and inform the organisation at all levels about what they need to do in order to deliver with more agility. Of course, it also comes back to the data as well. There is a need to validate the assumptions that you’re making. The right data allows you to flex, understand where to invest – ideally in real time – to drive those decisions. Sophie: How difficult is it for larger organisations to be agile? If you look at the look at the financial models of most large organisations, they would never be able to be purely agile. They need to set budgets, have longer-term investment plans and satisfy shareholders and investors. You need to be able to marry that operationally agile way of working with a more structured formal way of managing risk and investment in an organisation. There are some excellent frameworks to bring those two together. For example, there’s an initiative called SAFe, which is a scaled agile framework for enterprise. This tries to marry the enterprise portfolio investment risk-based needs of a larger organisation with the agile and operational flexibility that you wish to see at an operational level in the business, but it’s not easy. Sophie: How does a clear technical and data strategy help the business to transform? Many organisations see technology as a point solution. If they don’t understand what the vision is and how the technical and data architecture is going to enable that vision, technology will always remain point solutions. You run the risk of replacing your in-house IT with say SaaS platforms or outsourced IT, but it won’t be joined up. The whole point of having a technical data architecture strategy from the outset is to underpin the digital transformation. It should help people to understand how you’re going to bring that information together and how you’re going to use data to drive the behaviour of your business. Understanding where data is used in a business, where it needs to influence decisions and how it flows is extremely important. This determines what systems, integrations and technology are necessary. Every business can benefit from understanding how they want to integrate data across their organisation right from ‘the off’. This will differentiate them regarding how they can respond to their customer’s needs and the market, and grow their business. Another critical element which is historically overlooked is information security. Businesses should be attuned to their information, security risks, and how to mitigate them. You need to understand the data in your business and have an architecture for that data. You need to know what the risks are for a breach of data, your ability to meet your obligations around data privacy or how you can respond to things like the GDPR. Sophie: What is the best way to approach IT change? If you see the need to change and are sponsoring change that’s great – but the next question is, how do we do it? You need to ask what the business strategy looks like. What are the phases of transformation you need to consider? What challenges does each of those bring? Then you have to know what technologies are appropriate for that strategy. I recently chaired a CIO forum. The topic was around big data and digital transformation. There were 12 CIOs from very large representative organisations across the UK, brought together to understand each other’s challenges and how to overcome them. As we started talking about digital transformation, they immediately started an engaging and focused discussion around the external presentation of their business – their websites, mobile enablement and blogging etc. – all of the things I consider to be external to a business. That is really where those guys were thinking digital transformation starts and ends. None of them at the outset considered digital transformation being internally orientated. Of course, any business has to be customer driven, but digital transformation is all about being leaner, more capable, agile and joined-up as an organisation. Fundamentally, that means you actually need to look at your internal processes and operations and understand how digitisation can enable those things. Part of the challenge is if the leaders of the business believe that digital transformation is just about having a great website or having a mobile app. Fundamentally, I don’t think you will achieve success unless you take a broader view. Sophie: In your role, how do you help? Our role is to enable these businesses to understand what digital transformation will mean to them in simple terms. We’ve broken a hyped and complex topic for people to get their head around into something that is digestible. This enables them first to understand where they are on the journey, what it means for them, and how they can achieve the next stage of change. People often over-complicate things. You need to get those basic concepts. Starting engagement in the C-suite and helping them to ‘get it’ so they can articulate it to the rest of the organisation and encourage and motivate the whole business to embrace the change. Our role is about having those discussions at the highest levels within the organisation. Sophie: Barry, what are your two critical pieces of advice? Recognise it’s going to be hard and that you may need extra capability early on in the process. Often businesses try themselves and then get into trouble because they either don’t have the capability internally or they haven’t overcome cultural challenges. So engage early with people with the right skills and experience to set yourself up for success. Secondly, don’t have a narrow view about what the technology and technical solutions need to be. It’s a hugely fast-moving industry. Sometimes you need help to understand what technology choices are appropriate depending on what you want to achieve. Take time to look beyond your own IT, so you understand all the options and opportunities out there. Need some help realising your digital ambitions? We can help you to navigate a labyrinth of technologies and approaches, to create digital capabilities that drive operational efficiencies, improve customer experience, and allow you to conduct business online. Whilst addressing challenges around governance, compliance and legacy IT environments. We would be delighted to hear from you and offer a free 1-hour consultation via Skype or telephone.